Unfortunately, not all dogs have the best joints and supplements are usually a great, effective and inexpensive way to promote great joint health. You can find some of the best joint supplements for dogs at local stores such as Walmart, Petco, pharmacies, or online storefronts such as Amazon. As many local stores will vary in inventory depending on your city, state, or country, I will focus on canine joint supplements found for dogs on Amazon. When looking into joint supplements it’s good to keep in consideration what form you’d like it in (tablets, liquid, chewys, or powder), the potency of these supplements, and if it corresponds with the recommended dosage your dog may need, and if you need it to be anything more than just a joint supplement. TopDog Chewable Tablets – Your dog will just think they were given a treat because of how good they’ll think this taste. Little will they know they’re given a joint supplement that not only promotes joint mobility but joint function, cartilage health, and bone strength as well! TopDog tablets also contain 25mg of hyaluronic acid which supports skin care and is a dietary supplement. This has been recommended by some veterinarians for over 10 years and has a very high approval, and effective, rate. Particular Paws Glucosamine – This 100% glucosamine tablet relieves joint pain, improves mobility, and diminishes the need for any pain medications you are, or was thinking about, giving to your pet dog. Not only is this a joint supplement, but it also contains key vitamins and both omega 3 and 6 fatty acids. This isn’t only for senior dogs, if you have a younger, or middle aged, canine they can also take these tablets to prevent potential medical concerns. Nutramax Dasuquin Tablets – Including 150 chew-able tablets that was formulated after 10 years of research and clinical use, it’s been constructed for larger dogs that weigh above 60 pounds. Promotes all-around joint health and contains natural MSM. During the initial 4-6 week administration period your dog is recommended to take 2 tablets a day (as long as they’re in the 60-120 pound weight range); after that, to maintain joint health, 1 tablet a day is suggested. With more than 2000 satisfied customer reviews, this has become one of the top-sellers for dog joint supplements. Missing-link Coat, Hip, and Joint Supplement – Whether you get the 1, or 5, pound bag, you’ll be happy with what you bought. A formula specifically engineered to provide your canine with all around joint support, optimum nutrition, fiber, and omega 3 and 6 fatty acids! 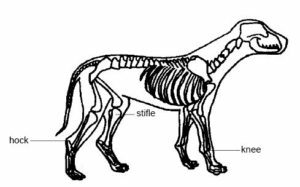 A great thing about Missing-link is that all dog sizes, and breeds, can use this safely. Glucosamine is also included into this blend to ensure healthy joints and even flexibility. A great supplement for a great price.